Prowl the streets on Halloween like you were the victim of a facehugger from the movie Alien vs. Predator: Requiem when you're wearing this high quality Alien vs. Predator Requiem Facehugger Alien Deluxe Mask! Eyeholes are covered in black mesh, and there are two breathing holes at the mouth for easy wear. The latex mask wraps around your face and features Velcro behind the head so it looks like you're in the clutches of a facehugger alien from Alien vs. Predator: Requiem. Don't settle for that old, adorable costume you've got buried in the closet when you could own the scariest costume accessory around with this Alien vs. 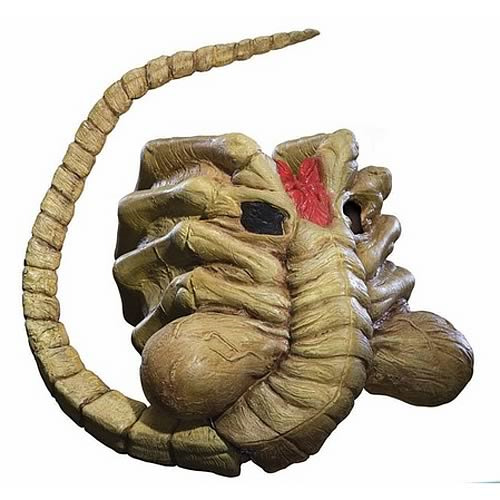 Predator Requiem Facehugger Alien Deluxe Mask!